A Sales Course that'll BOOST your B2B! Tired of getting all your sales education from the usual famous acrostics such as "A.B.C - Always Be Closing" or "K.I.S.S - Keep It Simple Stupid"? Well, we have a solution for you! Become the perfect sales guru and grow your business when you attend The Ultimate Sales Boot Camp with Dave Fellman! You'll learn how to have the kind of sales conversations that will enable you to grow your business significantly. 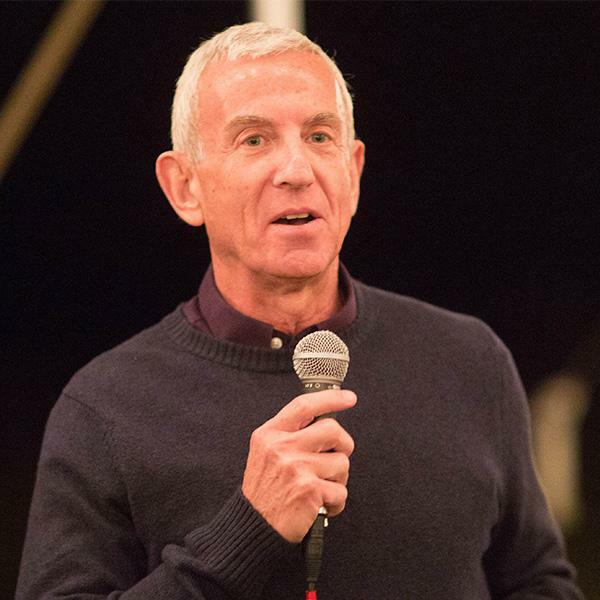 Fellman’s approach to sales training is a combination of skills, strategy and attitude. You will leave The Ultimate Sales Boot Camp with the knowledge – and almost certainly the motivation – to succeed. But that’s not all this program can provide for you. This year’s Boot Camp includes an ongoing coaching program! Over the first 30 days after you return home, you’ll have 3 one-on-one coaching sessions with Dave. This is meant to ensure that you don’t lose the momentum you’ll bring home with you, and to make sure that you can apply Dave’s sales principles to your own specific situations and opportunities. And if you want to extend this coaching program, that can be arranged! Show us your BOLD side and register today! 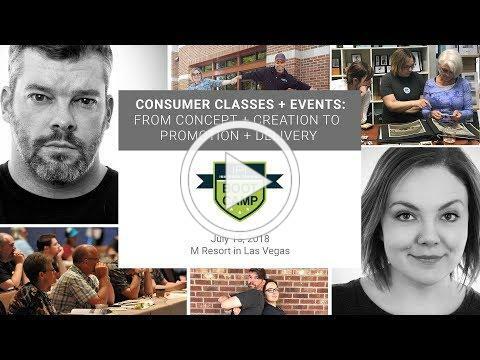 Become a consumer class + events expert! One of, if not THE best, ways to grow your business is through developing a culture of in-store social experiences by offering regular classes and events. If you’re looking to add thousands of dollars to your bottom line – you’re in the right place! Take a deep dive look into consumer classes and events best practices with instructors Jon Shaver and Brooke Welch. Discover how to create a curriculum, present content, promote your offerings and grow your in-store culture! And learn it from highly successful member representatives! · Create a social media, email marketing and in-store promotion campaign can will increase class attendance. This Boot Camp will leave you with the confidence, tools, and knowledge to run a successful educational and creative course within your business. Now go enroll in the Consumer Classes + Events Boot Camp today. 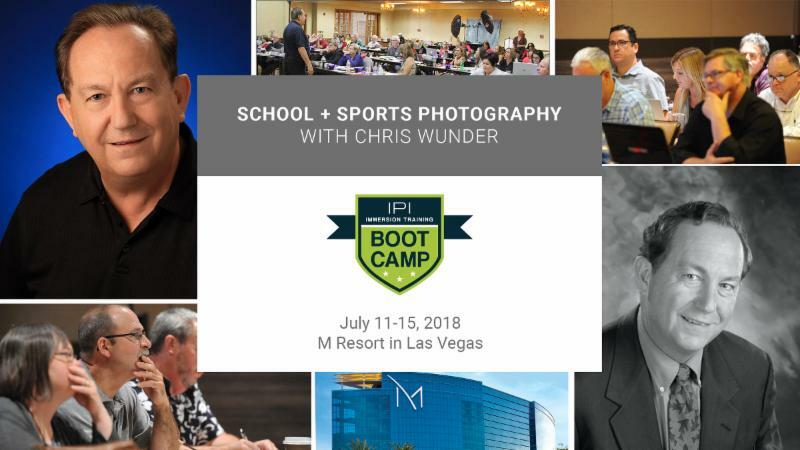 Increase your School + Sport Photography game with Chris Wunder! 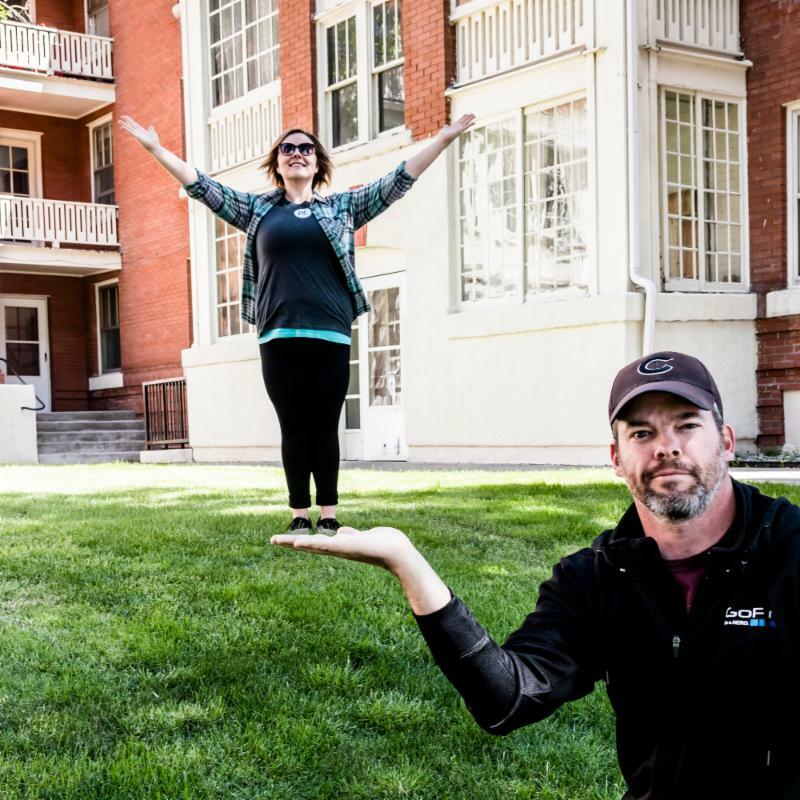 Your business can reach new heights when you join Chris Wunder's Pre-IPIC Boot Camp! If you’ve been wanting to start (or grow) a School, Sports or Childcare Center / Preschool photography component to your business, this is an event you don’t want to miss. This program features both classroom and hands-on learning experiences, with plenty of time for in-depth questions and answers. This multi-day Immersion Training Boot Camp course is well equipped with a jammed-packed agenda. From a few days of School + Sports Photography training to understanding Sales + Marketing for School, Preschool + Sports Photographers you will leave this class ready to implement within your business. This extraordinary comprehensive course is just another step in your journey of making 2018 your game changer of a year. Take the next step in BEING BOLD and REGISTER TODAY! What's Your Growth Strategy? Watch PR LIVE NOW! We heard a few of you singing "I wish more than anything, more than life, more than the moon, I wish they would extent IPIC Boot Camp Early Bird pricing." These unique, one-day experiences (offered in an 8-hour workshop setting) include implementable training opportunities that will increase your profitability. The knowledge you receive will be instrumental to you and your business. Bring yourself or send other members from your team to participate in this once a year event. So come one, come all to the Boot Camp of your dreams. Sign up today because being BOLD never felt so good. Take a deep dive into consumer classes and events best practices with instructors Jon Shaver and Brooke Welch. Discover how to create a curriculum and classes, present content, promote your offerings and grow your in-store culture! And learn it from highly successful member representatives! Retail, B2B, Schools, Sports, Events, etc. So you want to sell more? More retail with higher value? More B2B with higher profit margins? More school accounts? More sports teams? You name it; this Boot Camp covers it! Learn to have the kind of sales conversations that grow your business significantly. Includes BONUS one-on-one and group coaching sessions - designed to keep you on track after you return home. Early Bird pricing available thru 4/6! One day more! One more dawn! One more chance to start your new beginning. 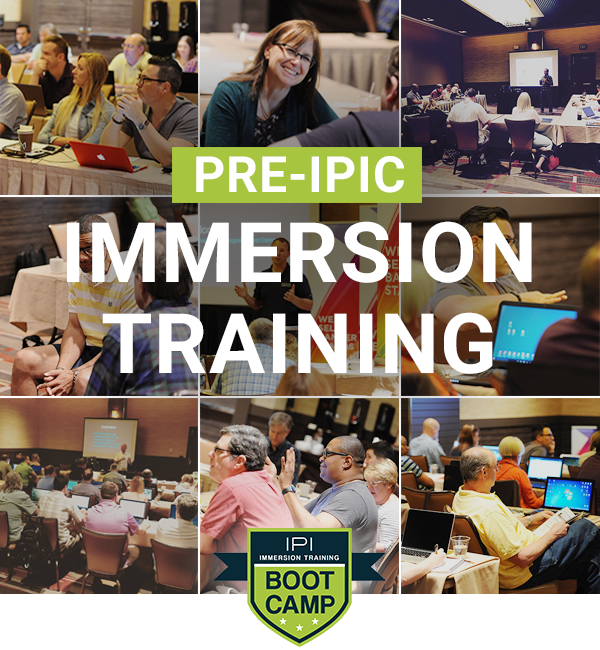 Tomorrow is your last day to receive Early Bird Pricing for this year's IPIC Boot Camps. We cannot overemphasize how superb these workshops will be. From The Ultimate Sales Boot Camp to Consumer Classes + Events Creation, you will receive the best training of your business life. And you're in luck, you don't just have to attend all by your lonesome. You can even bring other members from your team to join. 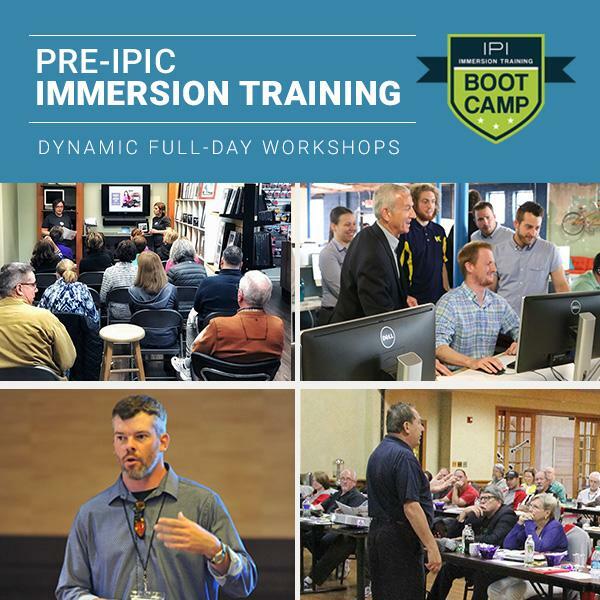 Now just in case you forget, IPI Immersion Training Boot Camps are unique, one-day experiences offered in an 8-hour workshop setting. Immerse yourself in implementable training on specific business models and methods, focused on increasing your profitability. The Boot Camp train is about to leave the station! HURRY: EARLY BIRD BOOT CAMP PRICING IS ALMOST OVER! I know what you're thinking, "How am I supposed to choose a Boot Camp, when they're all so good? Help me, help me!" The good news is you still have time to register for these amazing classes. And, if you can't choose just one workshop then sign up for them all. Don't worry, you won't have to clone yourself; just bring other members from your team to attend. The bad news is, well, THERE IS NONE, unless you include the Bad News Bears, but we're not. 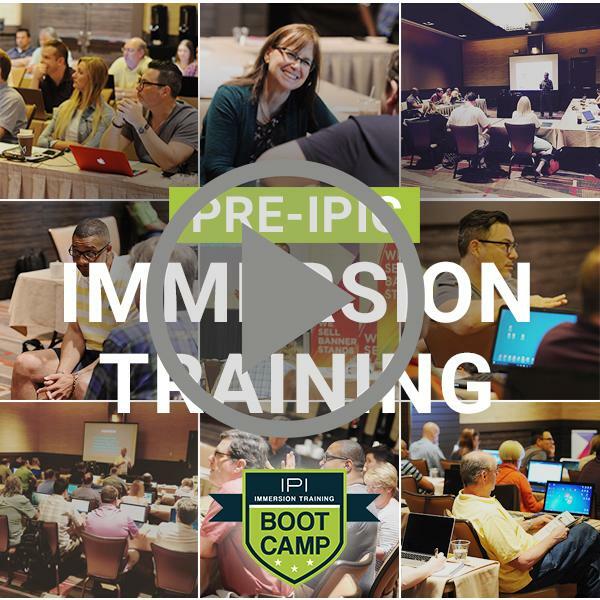 IPI Immersion Training Boot Camps are unique, one-day experiences offered in an 8-hour workshop setting. Immerse yourself in implementable training on specific business models and methods, focused on increasing your profitability. You may want to make your decision quickly because we have limited seats available - AND EARLY BIRD PRICING ENDS 4/6. So BE BOLD and sign up today! A member video so good even Jane Fonda is jealous! CONSUMER CLASSES + EVENTS MUSCLES? for the PRE-IPIC BOOT CAMP workout you've always wanted. Don't forget! Early bird pricing available thru 4/6! Looking for that perfect business growth workout routine? Then look no further. Take a deep dive into consumer classes and events best practices with instructors Jon Shaver and Brooke Welch. Discover how to create a curriculum and classes, present content, promote your offerings and grow your in-store culture! And learn it from highly successful member representatives! This Boot Camp is designed for to learn the ins and outs of running classes and events at their store. With this dynamic duo, you’ll discover the basics of class creation and presentation. You’ll learn how to capture the personality of your instructors and your store – including promotion and advertising tactics to get your events noticed. You will leave with the confidence, tools, and knowledge to be successful at running educational and creative courses. successful consumer class body you've always wanted. A meber video so good event Jane Fonda is jealous! Get ready, Get set, GO to IPIC 2018! If this video doesn't convince you then what will?! 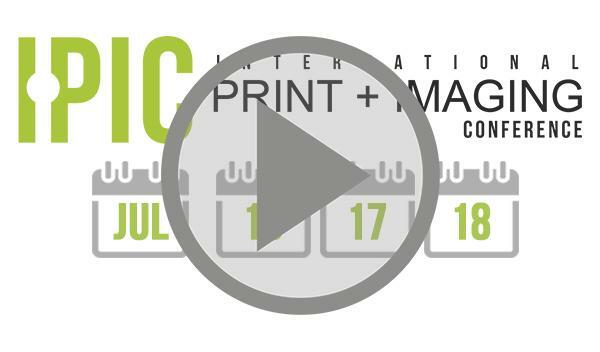 We hope you enjoy this little glimpse of what's in store for this year's International Print + Imaging Conference. Your IPIC experience has been reimagined for 2018 to focus on BOLD networking conversations and member-driven education that you cannot find anywhere else. Uncover member success secrets and discover unexpected morsels of knowledge as we turn the tables and put the audience on the stage. Don't forget registration is FREE for U.S. members ($199 for international). It includes most meals. We pack a lot into three days to limit your time away from your business. And anyone from your business can benefit - regardless of position or experience level. Thinking about adopting The Print RefineryTM ? 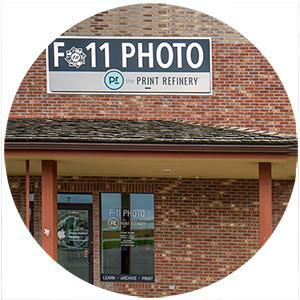 The Print RefineryTMbusiness model reinvents the retail and commercial sales experience with an innovative new approach to the specialty photo model.Don't pass up this limited time offer! · Six FREE hotel room nights during IPIC2018! · Get started for only $1,875 with new quarterly set up fee payment plan. · Visit www.theprintrefinery.com for details. 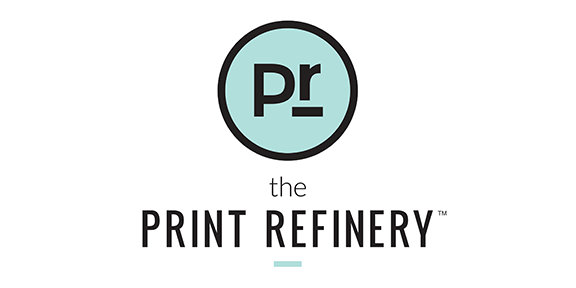 Start Your Journey with The Print Refinery Now! 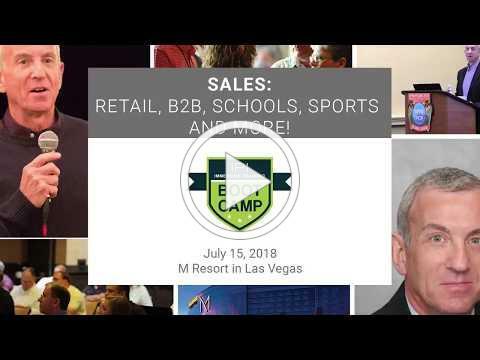 In The Ultimate Sales Boot Camp, Dave Fellman is going to teach you how to have the kind of sales conversations that will enable you to grow your business significantly. 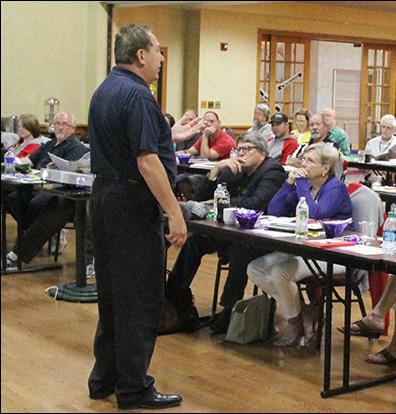 Fellman’s approach to sales training is a combination of skills, strategy and attitude. He brings nearly 40 years of printing sales experience, has published more hundreds of articles on printing sales and is the author of Sell More Printing. You will leave The Ultimate Sales Boot Camp with the knowledge – and almost certainly the motivation – to succeed. But that’s not all this program can provide for you. This year’s Boot Camp includes an ongoing coaching program. Over the first 30 days after you return home, you’ll have 3 one-on-one coaching sessions with Dave. This is meant to ensure that you don’t lose the momentum you’ll bring home with you, and to make sure that you can apply Dave’s sales principles to your own specific situations and opportunities. And if you want to extend this coaching program, that can be arranged! I "PIC" TO BE BOLD WITH IPIC BOOT CAMPS! 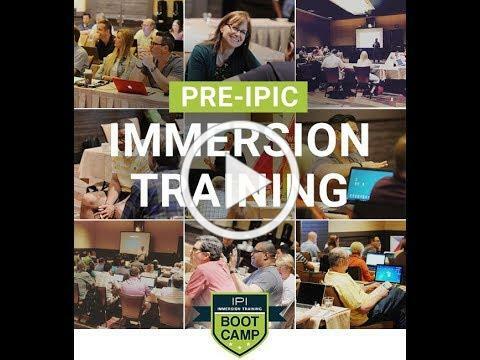 IPI Immersion Training Boot Camps are unique, one-day experiences offered in an 8 hour workshop setting. Immerse yourself in implementable training on specific business models and methods, focused on increasing your profitability. Which course is right for you? That's a tough one. With a variety of great courses to choose from you really can't go wrong.Consider sending other team members who can implement what they learn. You may want to make your decision quick because we have limited seats available. So BE BOLD and sign up today! You're invited to PR Live on March 21st! AND THE PRINT REFINERY™ MODEL CAN GET YOU THERE FASTER! 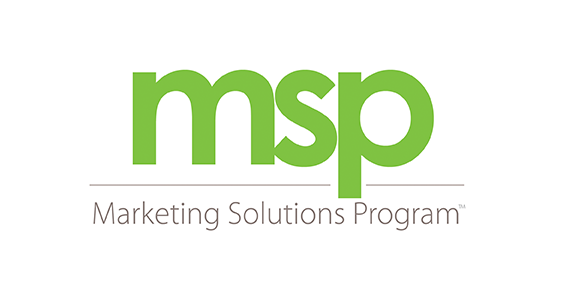 If you’d like to see double digit sales percentage increases in 2018, NOW is the perfect time to explore new options and ways to enhance your business.The Print RefineryTMbusiness model reinvents the retail and commercial sales experience with an innovative new approach to the specialty photo model. Is PR right for you? 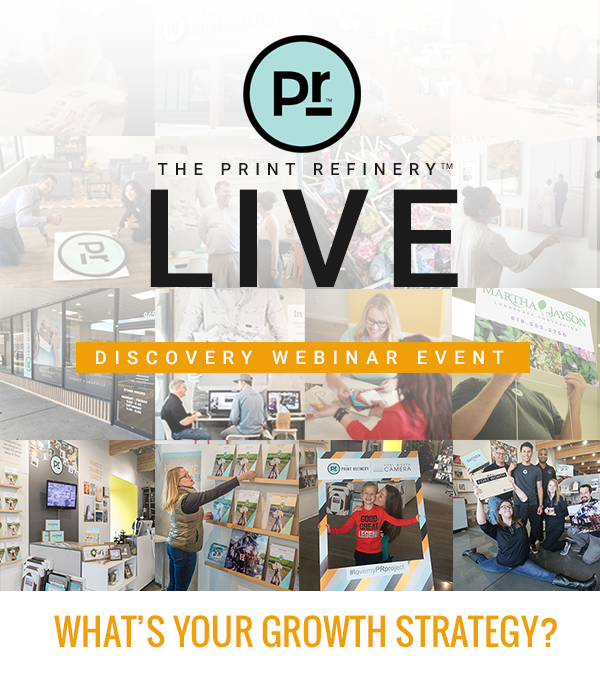 Join us to learn why The Print Refinery™ model is the quickest, most economical way to reinvent your business. Join us for this live webinar event! Get to know PR and what's ahead in 2018! IPIC 2018 Registration Now Open! I scream, you scream, we all scream for IPIC! 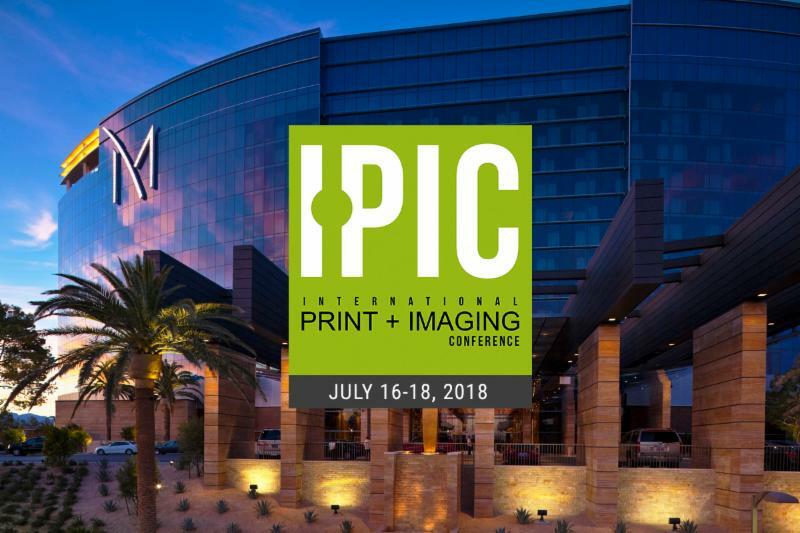 IPIC is your annual International Print + Imaging Conference. 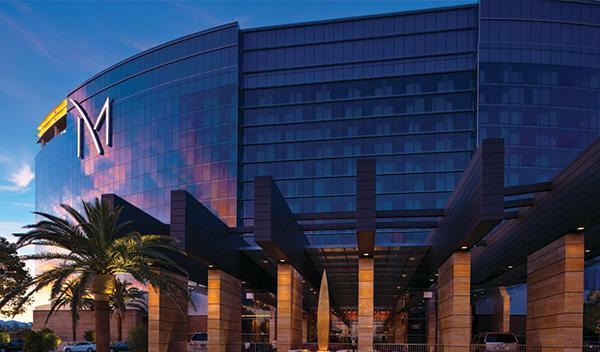 The IPIC experience has been reimagined in 2018 to focus on BOLD networking conversations and member-driven education that you cannot find anywhere else. Uncover member success secrets and discover unexpected morsels of knowledge as we turn the tables and put the audience on the stage. 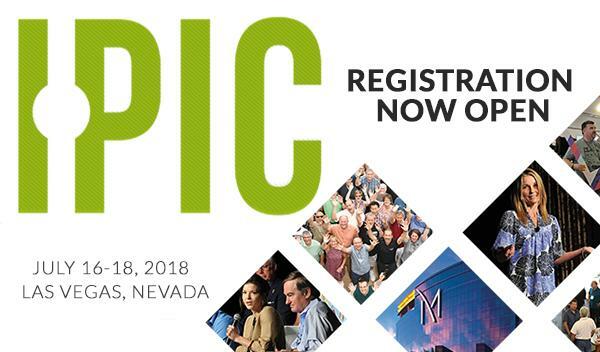 REGISTER FOR IPIC 2018 NOW! 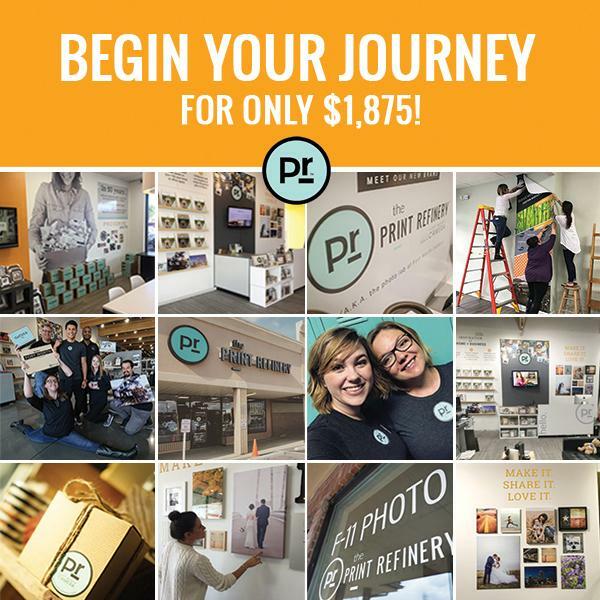 $1,200 Bonus to new Print Refinery adopters! An offer so good you won't know what hit you! 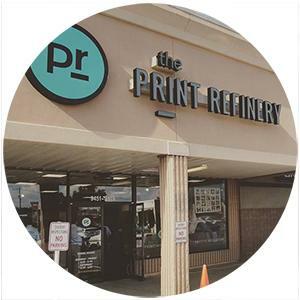 The Print RefineryTMbusiness model reinvents the retail experience with an innovative new approach to the specialty photo model. It fuses high-tech innovations with creative storytelling in an interactive hub of ingenuity. Don't pass up this limited time offer! Get started with The Print RefineryTM TODAY! Flexible quarterly payments make it easier to get started quickly! 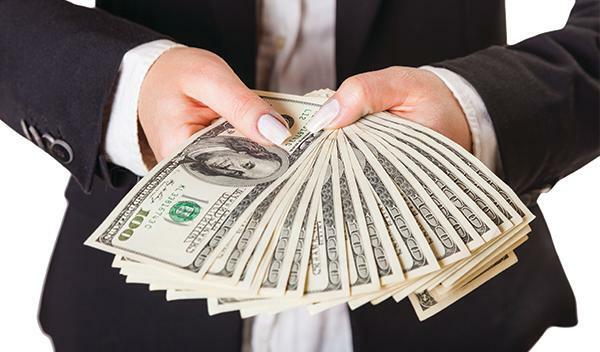 Get started sooner rather than later, now that the $7,500 setup fee can be paid in four quarterly installments of $1,875. From ordering supplies to managing the books, we understand that most IPI business owners are hands-on DIY types who like to be involved in every aspect of their business. And that's great - until you hit a point where you no longer know how to reach your goals and grow your business. When you started out, everything was tidy - your store was inviting and clean, your employees were driven, you had a plan and your yellow page ad was all the marketing you needed. Times have changed, but there are affordable solutions to help you get on track. We frequently receive questions like, "Hey, can you come to my store and tell me what you think?" or, "Can you help me set goals and create a strategic plan?" Heck, we've even been known to de-clutter inventory, train team members on the spot and vacuum floors! 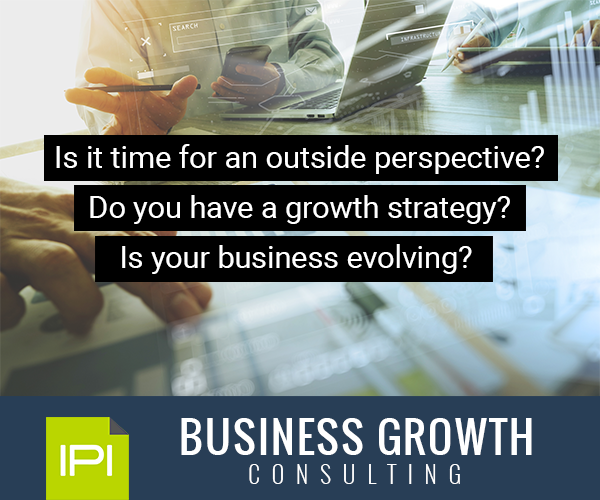 Those types of questions are what led us to develop IPI Business Growth Consulting. Whether you need a fresh set of eyes on your store layout, a second opinion on a new business development or a professional coach to help improve your bottom line - we'll connect you with an IPI affiliated consultant with expertise in your specific areas of need. · Virtual Consult - Work with your consultant(s) remotely using email, phone, screen share and online visuals. · In-Person Consult - Have a consultant come to you - allowing for an immersive environment with uninterrupted time to work with you or your team directly on-site. 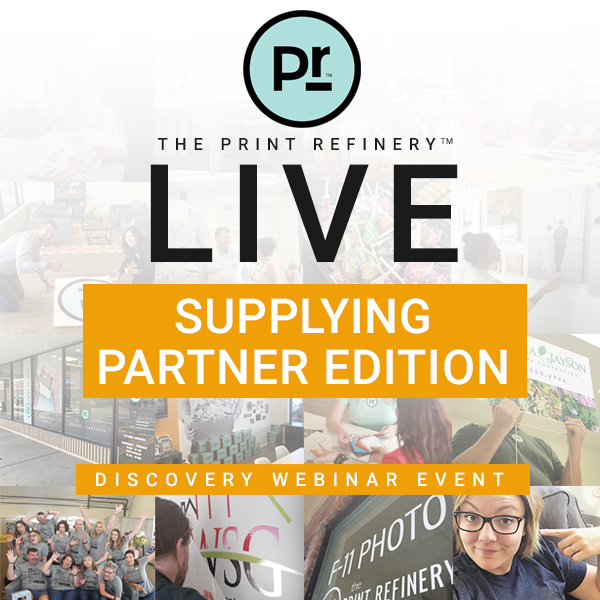 Thank you for joining us for PR Live Supplying Partners Edition! Watch Recording NOW! SUPPLYING PARTNERS, THIS ONE IS FOR YOU! We'll tell you all about The Print RefineryTMand how you can get involved. IPI members have realized double digit sales percentage increases in 2017. We're excited to show how this impacts Supplying Partner business. The Print Refinery™ model is proving to have a positive impact in specialty retail. Join us for this live webinar event! Get to know PR and what's ahead in 2018! Increases in decor + archiving sales before official brand launch! 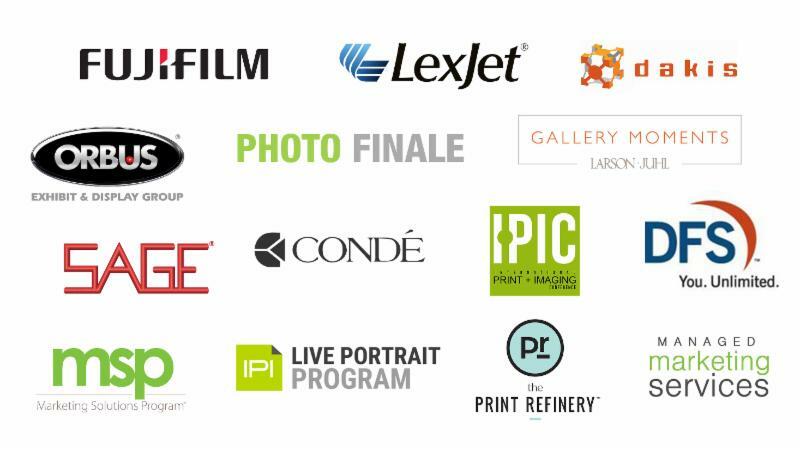 See for yourself how The Print Refinery™ can bring new members to your business. Specialty retail services can provide much higher margins (60%+) than hard goods sales in many cases, but, for the most part, you are dealing with smaller scale projects for home use. The same products and services that you sell to your retail customers for home use, can also be sold in larger sizes and quantities for commercial use (with possible profit margins of up to 85%). Think of the income generated when fully outfitting a hospital or hotel with wall decor! Here are just some of the many local businesses that should be using your services: mortgage brokers, restaurants, insurance companies, banks, doctor/dentist offices and realtors. Adding some signature commercially centered products allows you to demonstrate your wide range of expertise. Consider offering history walls, wallpaper, trade show displays, promotional products and checks/office forms. Finally, don’t let outside sales scare you. In your local market, you will find the most success in developing long-term partnerships with other businesses. 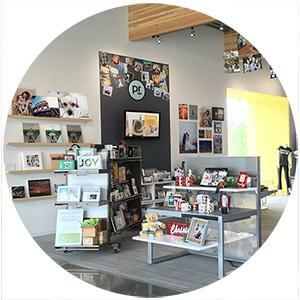 Position yourself as the local, go-to resource for everything print by visiting with local business owners and creatively brainstorming marketing, decor and display solutions. Let's welcome our new star player and Administrative Assistant, Lioba Conrad to the team. She will use her unique set of skills to manage member information, the Forum and provide stellar customer service. 2018 is off to a good start with such a great asset joining the IPI HQ Team! 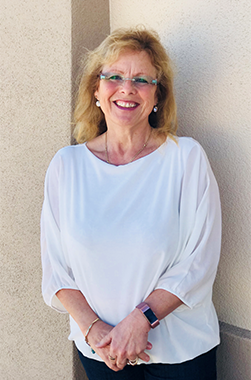 Lioba has over 25 years of Administrative Experience (to include Retail, Human Resources, Services).She previously was employed with the Army and Air Force Exchange Service (Department of Defense) and worked for AAFES in various positions in Germany, United Kingdom and the United States. Lioba loves the great outdoors and in her spare time enjoys Hiking, Nordic walking and Skiing in addition to traveling. New IPI Forum is now live! 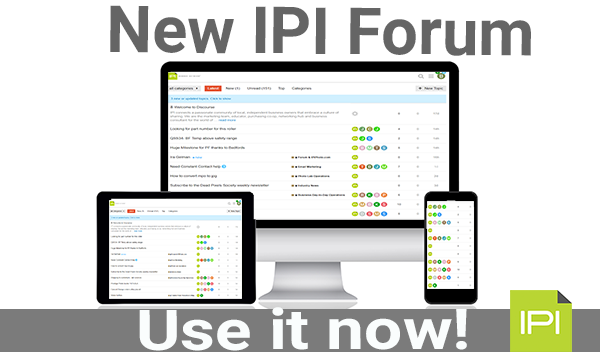 The new IPI Forum is now live! Did you just do a double take? Well, you read that correctly, the new Forum is finally here! Whether you're a first time user or professional poster, we've made our new user-friendly platform easy for everyone to use. Now you can post a new topic, ask a question, reply with technical info, share industry news, all with ease. To all our avid users, no need to worry, your profile is still intact and you can easily pick up where you left off. Looking for a specific topic or phrase? Need to find the right person to ask? We've got you covered. Our new robust search engine will find all that you're looking for without the headache. And it looks amazing on your mobile device! Start your conversation today with any member, retired member or Supplying Partner to gain all the knowledge for which you've been looking. What are you waiting for? All you need to do is log in and post now! If you have any trouble accessing the Forum, contact Natalie Gunn: natalie@ipiphoto.com. You can also contact Natalie to add access for the members of your team that truly need it. No more sharing profiles! 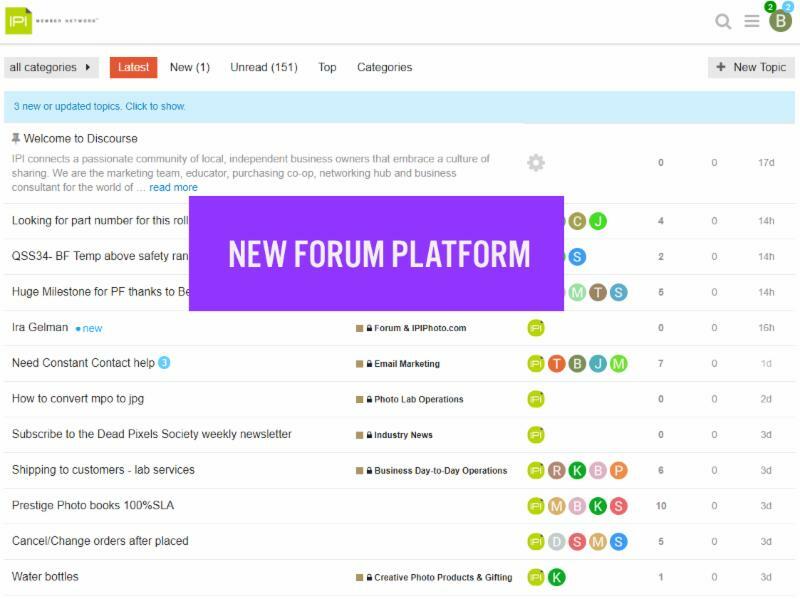 To learn how to use the new Forum in just six minutes, watch the video below! Even though the new Forum is live, there is still a lot to do. We are working behind the scenes to adjust settings and add features. If you come across any issues or have any "wish list" items, please post them in the "Site Feedback" category. You might notice that many old posts are popping up as new. That's because in order to preserve attached images and documents within posts, the attachments were added after the archive was loaded, so those posts will show as recently edited, even though they might be quite old. 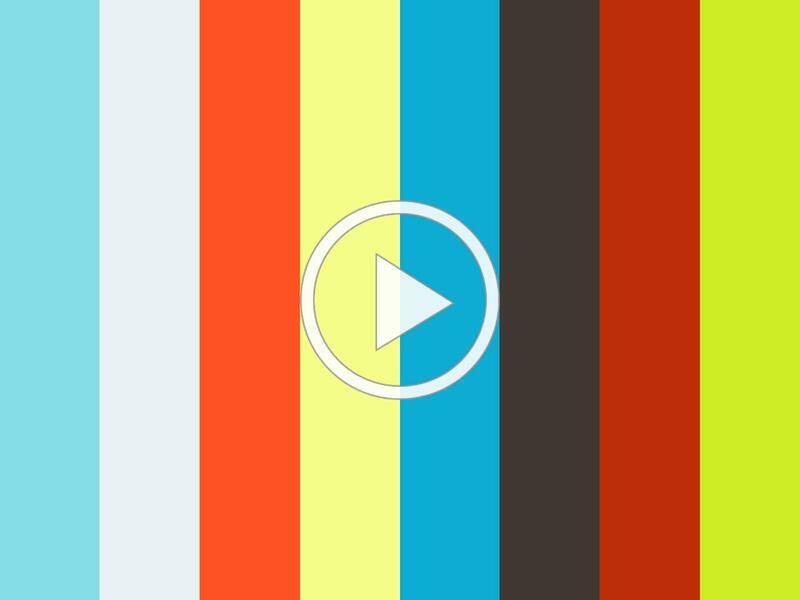 Finally, when watching the video above, pay special attention to the final section on creating a new post and how to categorize your post. Since the search function on the new platform is so robust, we do not need to maintain a cumbersome and confusing category list. Categories are strictly based upon who you want to see your post. 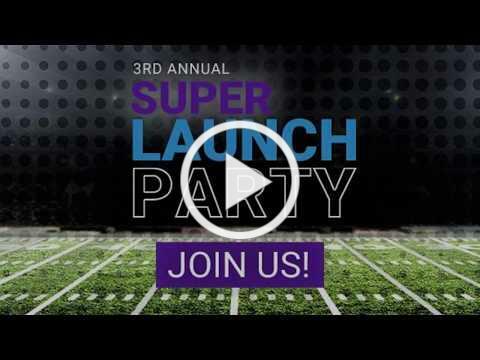 Watch the 3rd Annual Super Launch Party 2018! 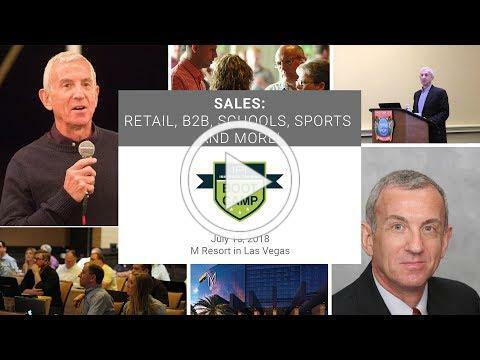 Now that you’ve watched the video, please visit our website and member brochure for details on IPI benefits, including our annual conference and Marketing Solutions Program. Please be sure to also check out our licensed business model. We look forward to the possibility of working with you in the future! 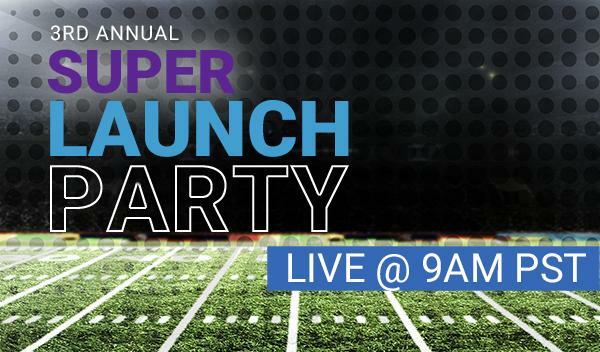 Super Launch Party is finally here! Join us live today, January 31st, 9:00am - 10:00am PST. Register now for our special event! We plan to be bold with this year's winning moves! You better not miss out! 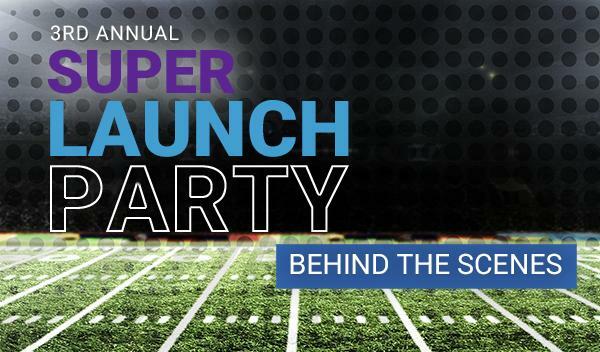 1 Week Until Super LAUNCH Party! Join us live Wednesday, January 31st, 9:00am - 10:00am PST. We are one week away from this entertaining event that will leave you excited for the new year. 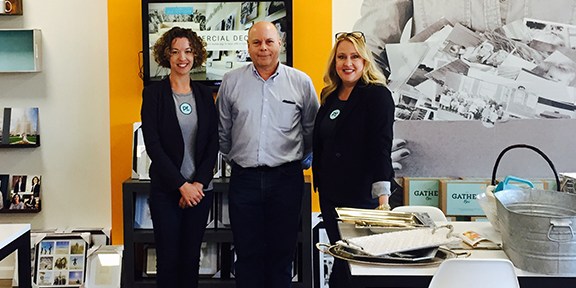 The IPI HQ team will provide you with all the essential educational materials to captivate your audience and increase sales. With upgraded fundamental programs your business will reach new heights in 2018! Let this year's playbook full of winning moves capture the attention of your target customers and make you more money! 2018 will be your gamer changer of a year! Let's take one last behind the scenes look at IPI's winning playbook. Set your DVR to the IPI Network because the team will invade your television screen with new 5 minute broadcasts, training videos, webinars and interactive chats. IPI will make it easier for you to increase your knowledge of all IPI services. Need a fresh set of eyes on your store design or expert input on goal setting? Hire the IPI HQ team to assist you with a variety of business improvement strategies. Heck, Brenda and Erin might even show up on your doorstep to give your place a makeover! We're pushing the envelope on this popular program by adding lots of new time saving components! Watch as several exciting new products, services and marketing tools are added over the next 12 months! Get a sneak peek! Exciting new things are happening with The Print RefineryTM brand. From open house events to new locations, we will make a huge splash with this years licensees! Learn how you can become a PR location for only $1,875! It’s time to put the spotlight on your business. Accomplishing your goals is no longer enough. It’s time to show off all of that hard work and build support within your own local community. Showcase everything that you do, plus what is new and exciting about your business. An open house should be your annual spring board for the holidays or busy season, pushing you towards an early deadline for implementation and team training on all new initiatives. IMAGINE– all of your new initiatives implemented, your location in pristine condition, your team trained and your community informed BEFORE your busiest selling season! Think of the amazing customer experience that you can provide when everything is already in place and customers can be your only focus. Involve your full team. Keeping them engaged and motivated with a level of responsibility and accountability is the key to being highly successful. Start planning early and stay organized. Start planning your event at least 60 days before it takes place. Create a calendar for your team and a detailed checklist. Breaking the event down into small, simple daily tasks that are assigned to specific team members will make for successful execution. Keep the calendar/checklist in a centrally located area so that all team members can track the progress. Partner with other local businesses. To highlight members of your community and save on expenses, ask local businesses to be the vendors for your event. Offer them promotional opportunities in trade for free or discounted services. Make your planning process easier by relying upon their expertise. Arrange for these services as early as possible in the planning process. What do they require for set up? What do you need to provide? How early will they need to set up? Ask them to preview the space. Confirm each partner’s participation one week prior to the event. Set the scene. Look at your business from the eyes of a new customer, from the moment he or she spots your location to the time that he or she is leaving your area. Start with curb appeal, then focus your efforts on your customer space and private work areas. Do not neglect your bathroom! Pull weeds; paint curbs; clean windows and refresh window displays. Organize interior displays and backroom supplies. Thoroughly clean every inch of every area, inside and outside. This is the time to invest in carpet cleaning, and other commercial cleaning services. Repair and replace dated, damaged or unappealing items. A fresh coat of paint can work wonders! What needs to be purchased? What can you create in-house? How much will this cost? Brainstorm a locally inspired theme. Celebrate your local culture and infuse seasonal elements. Brainstorm ways to communicate to visitors that you are opening up your family, home and business up to their family, home and business. What décor can appropriately accomplish these themes? Is there another local event, holiday or season that you could represent? Update all samples and displays. Update all dated and worn samples. Create samples of all new products and services that you will be launching. Feature local images by community artists and your customers on all samples to keep with the theme and the neighborhood atmosphere. Update your digital signage feed. Update and print brochures, rack cards, newsletter, stuffer and calendar of events. These can be placed anywhere and everywhere during the event, as well as inside gift bags. Create a unique guest experience. Plan out every moment of the attendee experience. How will traffic flow through the event? Where will food, beverage and entertainment be placed? What will enhance the guest experience and help to make it seamless? Require “all hands on deck” for maximum success. All team members should commit to being at your event prior to set up until after cleanup is complete. Have custom name tags created and worn. Consider also having team shirts. These could be fun and themed. It is important for guests to be able to easily pick out team members. If you are adhering to a more stylized theme, consider hats or costumes. Offer meals, snacks and hydration to your team throughout the day. Take turns taking breaks and eating, one at a time. Treat your team to a celebration within one week following the event. Celebrate your success and discuss your next event! Be the host(ess) with the most(ess)! Do not schedule yourself to do anything but be the host/hostess. Socialize with your guests. Personally acknowledge and thank your partners and special invited guests. Your sole responsibility is to create, foster and nurture relationships with the members of your community on behalf of your business. 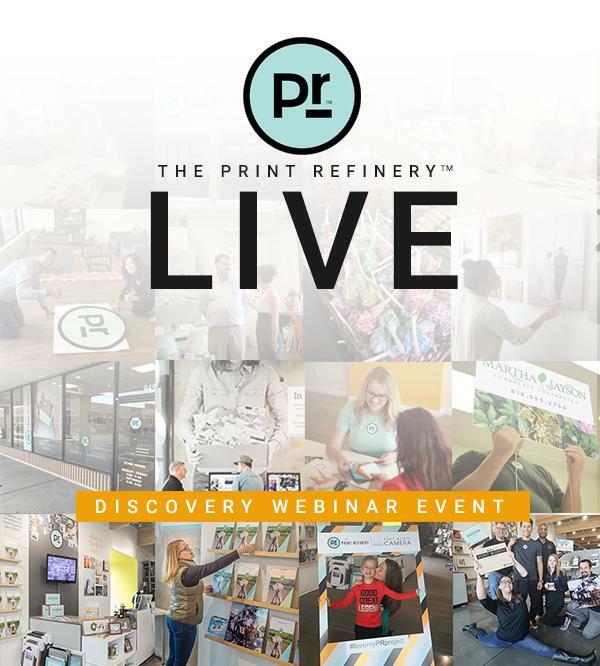 Check out the promo video for our next brand launch open house for The Print Refinery: https://youtu.be/n6uaKu1bee0. 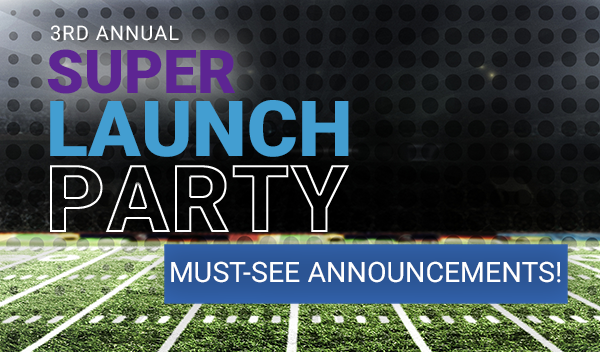 3rd Annual Super Launch Party 2018! 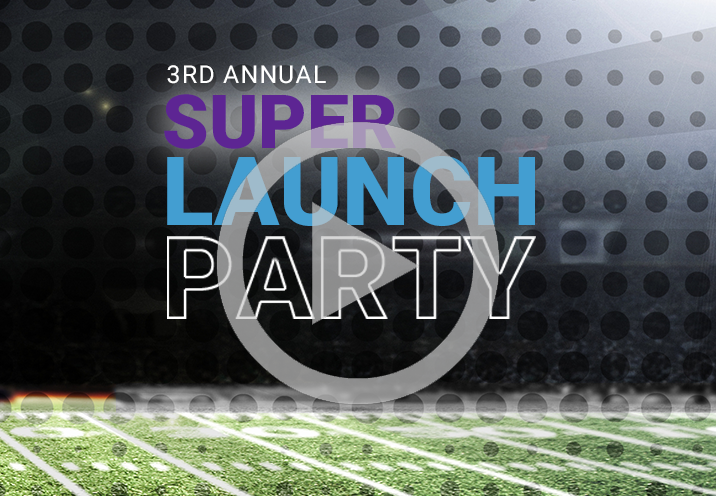 Our third annual Super Launch Party will be an exhilarating whirlwind of an event. From broadcasting live from multiple member locations to wacky costume changes this party will be one to remember. Who says an educational party has to be a dull one? You may be wondering, what is in-store for you this year? 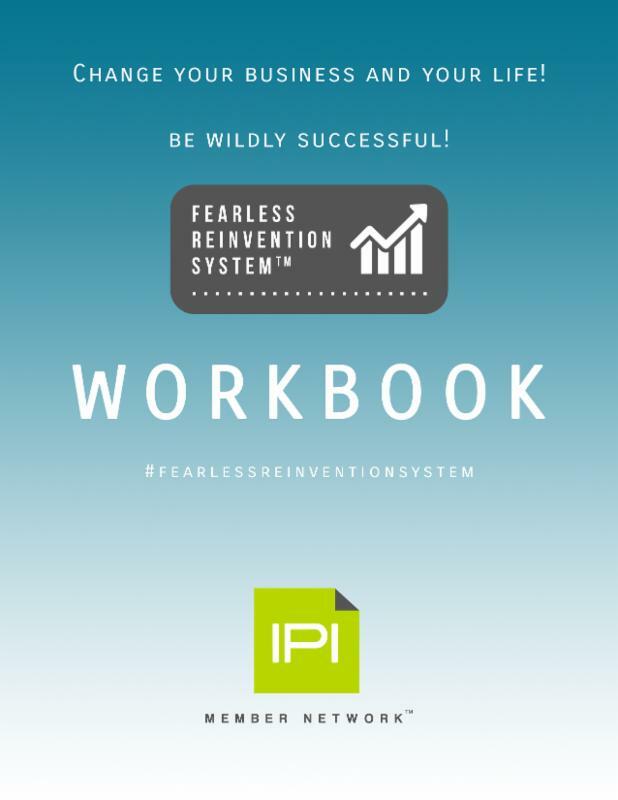 With a new "touchdown winning" attitude the IPI HQ Team has set the stage for a game changer of a year, devising an intricate playbook filled with numerous winning moves to capture the attention of your target customers and make more money! 2018 will be your year to be BOLD! 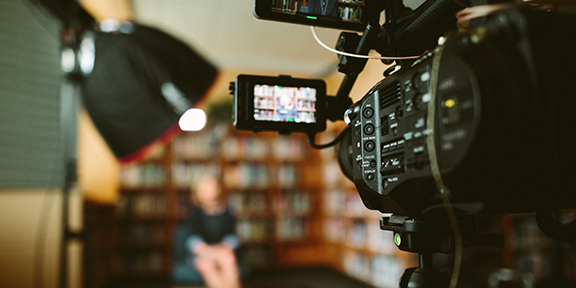 Take a behind the scenes look to see what's in IPI's winning playbook this year. - Clean + easy to use design + additional access for Supplying Partners to contribute in more areas ! 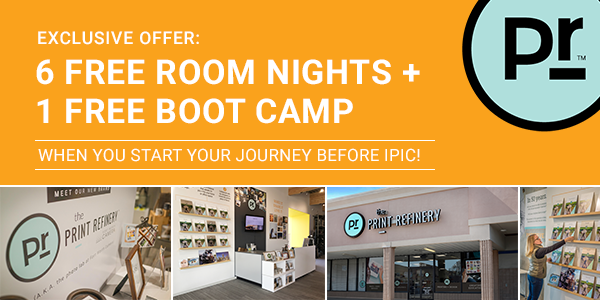 IPIC + Boot Camps 2.0! - Early bird registration will be open for members + Supplying Partners. You'll be amazed at what's new this year. Live Member + Supplying Partner Participants!